PHILADELPHIA, PENN. 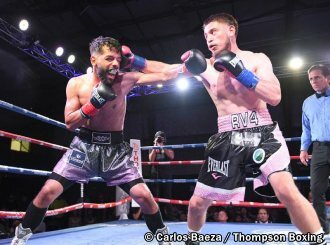 / ORANGE, Calif. (Oct. 15, 2018) - Featherweight Ruben Villa (14-0, 5 KOs) returned to his hometown for the second time in his career and delivered a thrilling, one-sided performance against the game Miguel Carrizoza (10-4, 2 KOs) Saturday night from a sold-out Storm House in Salinas, Calif.
"I felt great tonight," said Villa, who is promoted by Banner Promotions and Thompson Boxing. "Everything was clicking. The guy was tough. I landed a lot of good shots and he came coming back. I'm very happy with my performance. I put on a great show for my hometown fans." "I'm gaining more and more confidence with each win," Villa said. "I like where I'm at right now."